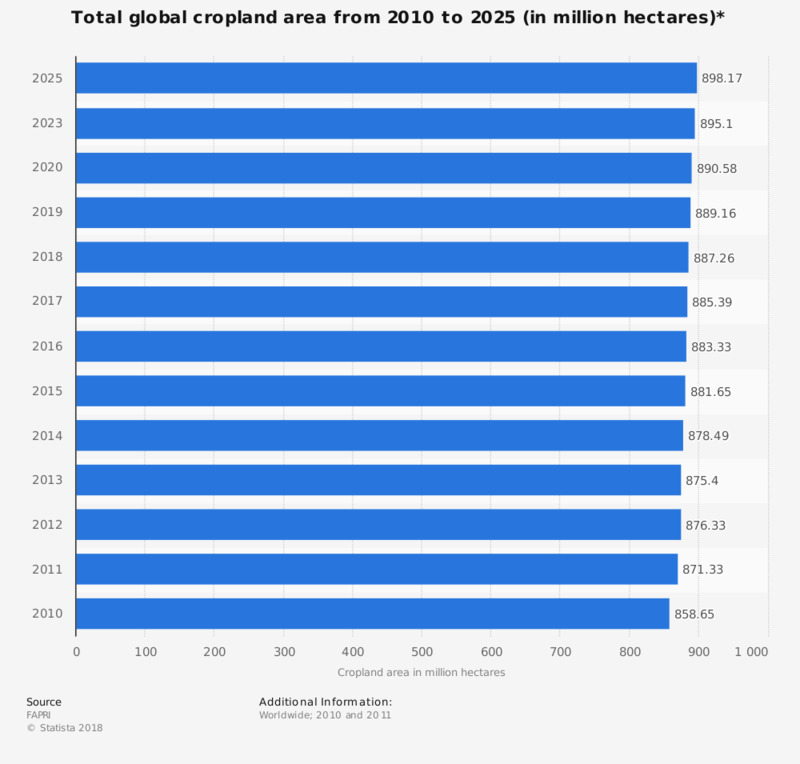 This statistic shows the total global cropland area, in a projection from 2010 to 2025. In 2015, the total global cropland area is expected to be 881.65 million hectares. Over the years humans converted grasslands to cropland areas, this allows food for humans. It is obvious that the rising number of people living on earth forces us to cultivate crops that need not to be replanted after each harvest, such as cocoa and coffee. The cocoa bean is used as the base for chocolate and many other chocolate products. The global cocoa production grew steadily from around 1.67 million tons during crop year 1980 and 1981 up to 4.3 million tons of produced cocoa in crop year 2010 and 2011. Chocolate made in Switzerland is famous all over the world and the Swiss population leads the ranking of the per capita consumption of chocolate products. In 2011, 10.55 kilogram of chocolate products were consumed by Swiss people, based on average. The worldwide coffee production has also increased from 103.91 million bags in 2003 to 145.78 million produced bags in 2013. Fair trade coffee is becoming increasingly popular in the United States. The United States imported more than 163.01 million pounds of fair trade coffee in year 2012. The imports have been growing rapidly since 1999. In contrast to that, only 2.05 million pounds of fair trade coffee were imported in year 1999. The brewed beverage made of roasted coffee beans is an evergreen in most peoples’ morning routine. The Netherlands is the top leading coffee consumer country in 2013 with an average per capita consumption of 2.41 cups per day.